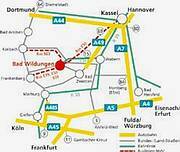 It’s easy to get to Bad Wildungen thanks to its central location in the heart of Germany and its inter-regional transportation links. Generous bypass roads also ensure that traffic is kept to a minimum within the town’s limits. B 253 and B 485 main roads. Our route planner can also help you to choose the ideal route. 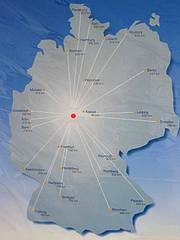 Deutsche Bahn operates constant, modern train services from the Inter City Express station at Kassel-Wilhelmshöhe, ensuring that you can reach your destination, the Bad Wildungen train station, in comfort and on time. The efficient BKW Town Bus System and a diverse range of bus trips mean that you don’t need a car to be mobile in and around Bad Wildungen. Many of the hotels and clinics will offer to pick you up from the train station and take care of your luggage. We hope you enjoy the trip!